5 Minute Librarian: Install and Update All Your Programs at Once - and for FREE! Install and Update All Your Programs at Once - and for FREE! 1. You want to find great free programs (anything from security to images to media to documents). 2. You want to download program(s) quickly, with just one click of the install button. 3. You want to update your programs. 4. You DON'T want toolbars or any of the other "add-on" programs. 5. 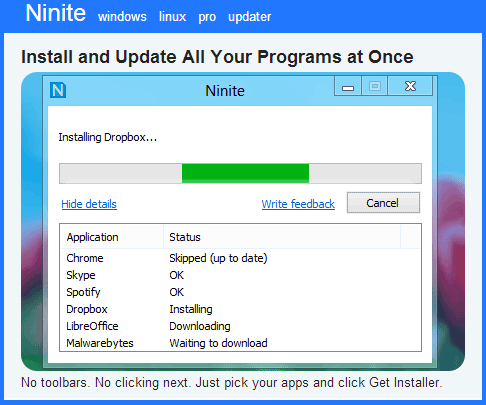 It really is what they advertise -- click all the apps you want, click the installer, and then wait for it to download. You are done in seconds! 3. Patron requests for free programs, like antivirus software and compatible Microsoft Office programs. 4. Quickly updating your programs to the latest version.